I discovered Fiona on Facebook after praying for a coach who would understand my situation. After a painful divorce from a 30 year marriage, I felt stuck, broken and unable to move on. Fiona hosted a webinar where I learned that she had been in my shoes and offered hope. She offered a free session to learn about her coaching program. In that one hour, I could see that Fiona cared and wanted to see me succeed. I walked away with immediate actions and a renewed hope. Fiona and I started a 12 week session where I used many of the tools she offers in this book. 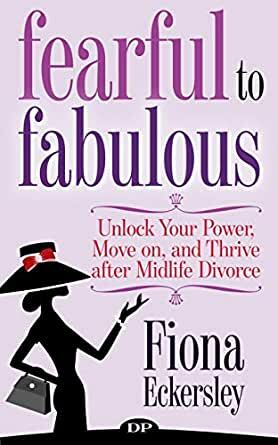 In Fearful to Fabulous, Fiona easily connects as she shares her own journey through this painful process but also provides examples from her clients, demonstrating how practical and successful they are in making a difference. The book helps the reader to see that we are not alone in this journey, that there are situations that are common and offers tools to help us not only get unstuck, but help us make a positive change that can bring a brighter future than we can ever hope for. This is a book that I will be able to read and reread, using the tools to remind me of what is important and to help me keep making forward progress. Fearful to Fabulous is both a love letter and a helpful guide to women going through divorce after long marriages from someone who's been there. It covers all of the areas -- finances, self-identity, friendships, and more -- that get thrown into disarray from a midlife divorce. It has helpful exercises and techniques, and it absolutely shows you that you're not alone, that someone understands what you're going through, and that others have gone through it and found their way to a better sense of themselves and a better life -- and so can you. This book is so great! I feel like I am sitting having a conversation with Fiona! I related to so many things and she really tells the story in a way that you feel validated for the feelings you have. The book will definitely let you know you are not alone and everything you feel is okay and is felt by so many experiencing the same life changing events! Encouraging words, heartfelt experiences are the words I would use to describe this book. 5.0 out of 5 starsA positive and upbeat guide to conquer divorce and reclaim yourself! I would recommend this book to all my friends who have gone through divorce and also women who have lost sight of themselves while married and raising children. I found the quotes at the beginning of each chapter insightful and inspiring! The author outlines strategies to conquer the phases of divorce and refocus your life in a positive and productive manner. A book I find myself referring back to again and again.